The Organizette!, Issue #95 -- Clean Your Home in 20 Minutes A Day? Hello Everyone! Well, the new job is going good (I have only worked there for two weeks), but the household chores have kind of gone by the wayside. I am really struggling to find a new balance between outside work and “at home” work. Once I get home and have a little lunch, there is about an hour until my youngest gets home from school, then homework and dinner prep begins. I am looking for a way to schedule short chores in the afternoon along with other home management things that need to be done. There is definitely less time to toodle around on Facebook! This is an eye opener to just how short the day is, and the need to prioritize what’s most important to us. What’s more important… following the latest on social media, or having clean underwear and clean dishes to eat off of??? Scroll down below see about cleaning our homes in 20 minutes a day. Can this actually work? If you love to shop online and you're not using Ebates, you're leaving money on the table! Earn cash back for your online purchases you were already making! I have received several "Big Fat Checks" over the years! Check it about. Click on the Ebates logo. Bathrooms… one of the busiest rooms in the house, and one of the very least fun to clean! Yet it definitely needs to be cleaned on a regular basis. I can’t proclaim to be an expert on bathrooms, so maybe we can all learn something from a little review of October’s monthly mission by clicking here. Amy Knapp''s Big Grid Wall Calendar is my ALL TIME favorite calendar with its huge boxes! And it's time to order a new one! With kids in school, I find it easier to use a 16 month calendar from August to August and this one works perfectly. Plus, it's super affordable! 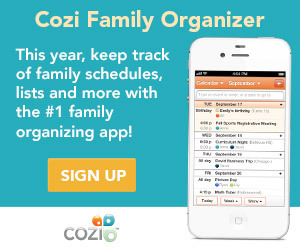 If you prefer to go digital, you might enjoy the Cozi Family Organizer. You can sync everyone's schedules together at no charge. 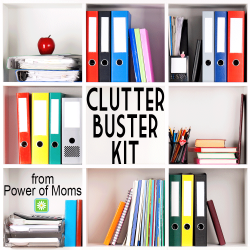 Organizing Kids Rooms - Help your kids help themselves to be better organized. One can hope! Grocery Shopping Tips - Do you need to streamline your shopping trips? Learn how to get in and out in less than an hour, once a week. Organize your bathroom - How to keep your bathroom more tidy and clutter free. Time Savers - Here are a few quick time savers to make your day run more efficiently. How to Clean Your House in 20 min. A Day? In my attempt to readjust the household routines with going back to work, I looked around for some simple ways to keep the house clean and tidy with minimal time commitment per day. I found the following article which seems hopeful, suggesting we can clean our homes in 20 minutes a day. However, to be realistic, not without some modifications. After the introduction regarding things that need to be done daily, it goes into a list of one main chore per day that is supposed to take no more than 20 minutes. However, on Day 2 it says “Clean bathrooms (toilets, showers, floors, walls, mirrors).” Um, it will take me more than 20 min. to do one full bathroom and there are three bathrooms in my house. The hardest part for me is cleaning showers and tubs. Anyone else? One tip I learned from Flylady a long time ago is that once you’ve cleaned your bathroom, a daily swish (of the toilet) and swipe (of the counter and sink) will keep it looking fresh for many days to come. However, I will need to train my family to swish and swipe daily because I’m certainly not going to follow behind them and do it. I’ll take care of my own bathroom though. Day 30 it says to sweep and vacuum all floors in the house. Not going to happen in 20 minutes! There is a lot of floor space and a lot of dust bunnies that like to hide on the edges which requires the crevice tool and then the regular vacuuming of the rugs. Plus, stairs and the bedrooms upstairs. It’s a full-on workout and definitely takes more than 20 minutes. So, I’m going to print out this list and modify it a bit to be a little more doable for myself. Hopefully I can get the rest of the family to participate as well.